A while ago I made a a very simple kimono style jacket. At about the same time I came across this far from simple free download Alexander McQueen pattern which is also for a kimono jacket. I said I’d give it a try and here are the results. Back view first, as that’s where all the elaborate pleating is. The front’s a lot simpler by comparison although I still spent some time figuring out how to fold the pleats at the bust dart. I made this out of black cotton poplin from Minerva Crafts. It’s 115cm wide and I used about 4m. I didn’t make much effort to lay the pattern pieces out efficiently so that’s an upper limit. Cutting it out was tricky as the body pattern pieces are huge and require a lot of marking. I did what felt like hundreds of tailor tacks to mark the pleats on the first body piece. I couldn’t face doing the same on the mirror image piece so I drew over the tacks on the first piece in chalk, dropped it on its unmarked twin and pressed down. Enough chalk transferred to the second piece to show the markings, although they needed going over again with the chalk wheel. You can just about see where I lengthened the pattern by my usual 5cm. That was probably a little too much. The pattern is one size only, I’d say about a Big Four size 10. By the way, it doesn’t say this anywhere on the pattern but the seam allowances seem to be 1cm. The original pattern had no instructions. However it must have been been updated since it first came out because inside the zip file you download are a set of contributed instructions which were absolutely invaluable. I’m not sure I understood them all because I ran into some problems, but I’d have really struggled to put this together without them. The issue I had was that in a couple of places I ended up with pleats sewn completely shut. When I compared with the original garment this clearly wasn’t right; the point of this style is the volume and folds you get by leaving the pleats open other than at the top and bottom. Anyway I ended up ripping a few stages out to allow the pleats to billow out. I also added a few bits of stitching that weren’t mentioned, mostly to hold the pleats in place at the hem. Here’s a closeup of what I ended up with. The pattern doesn’t mention anything about interfacing. I interfaced the collar and back hem facing which I think was the right decision. The hem really benefits from a bit of firmness. There’s also no mention of lining. I presume the original design was lined; I’ve certainly seen a very similar Alexander McQueen jacket on Net-a-Porter with lining. However there was no way I was going to try to draft a lining for this little experiment, so I’ve just overlocked the visible seam allowances. So what’s it like to wear? It certainly catches the eye, but it’s quite comfortable. I appreciate the fact that you don’t need to wear anything else fancy with it. I made these black trousers in part to go with it, but my black skinny jeans would have been fine. Obviously these shoes are just for posing purposes! I doubt I’ll ever make this again. But it was a fascinating project and the end result’s surprisingly good considering how little I understood how the pleating works. I have actually worn it out of the house; that’s definitely a success. Posted on June 30, 2013 April 14, 2016 by catherinedaze	This entry was posted in dressmaking, Finished, patterns, sewing, Style and tagged alexander mcqueen, dressmaking, sewing. Bookmark the permalink. Wow! I love it! What a huge amount of work! Reust is stunning. I have that pattern but haven’t made it yet. it looks amazing on you, so simple but effective. I tend to say ‘wow’ a lot when I see your finished projects Catherine, and this one is no exception! The construction and fit are seriously impressive and you’re seriously impressive to tackle it with no real instructions! That looks incredible! All those pleats and folds are fantastic. Thank you so much for your comprehensive review – I actually have this pattern but hadn’t worked up the nerve to give it a go yet. You’ve been very helpful! Well done – what an amazing piece of construction and sewing! The final jacket is a great shape on you; those pleats and folds in the back are wonderful. Hello! This is fascinating! I have that pattern downloaded in my computer ages ago, and once -I had a look at it and saw how complicated it looked I just forgot about it! You are an amazing seamstress, you could put this toguether and look so good! Well, this is certainly very high fashion, I really like it on you. Your post is quite timely as I have the same pattern and was going to use it recently for a beach cover-up, but found it too confusing so did not attempt it. I made another free download cladded Peachy Beachy cover-up in a kimono style that was far simpler. Oooh! This is fantastic on you! I’ve had this pattern saved for a while now and been too intimidated to tackle it sans instructions. Maybe I’ll have to add it to my Autumn sewing plans. Since I wear a Big 4 size 10 it doesn’t seem as daunting now. Kudos to you for having the patience to complete this, your hard work was worth it as this is Gorgeous!! Bravo!! the jacket and you in it look absolutely amazing! Thank you *so much* for mentioning the new instructions, I’m going to get hold of those right away. I tried to make this jacket back in its early days and had to give up because I made such a hideous hash of it. Congratulations on finishing such an interesting and complicated garment! It looks fantastic on you, and I like it in black. I’ve admired this jacket from afar for a couple of years, but haven’t gotten up the nerve yet to make it! You dared! Good for you as this is quite stunning! Bravo! That looks wonderful and well made. I have had that pattern printed out and in my pattern stash almost since it was released but I’ve never quite dared to make it up between not quite being able to figure out the sizing and needing more information from the all too brief instructions. 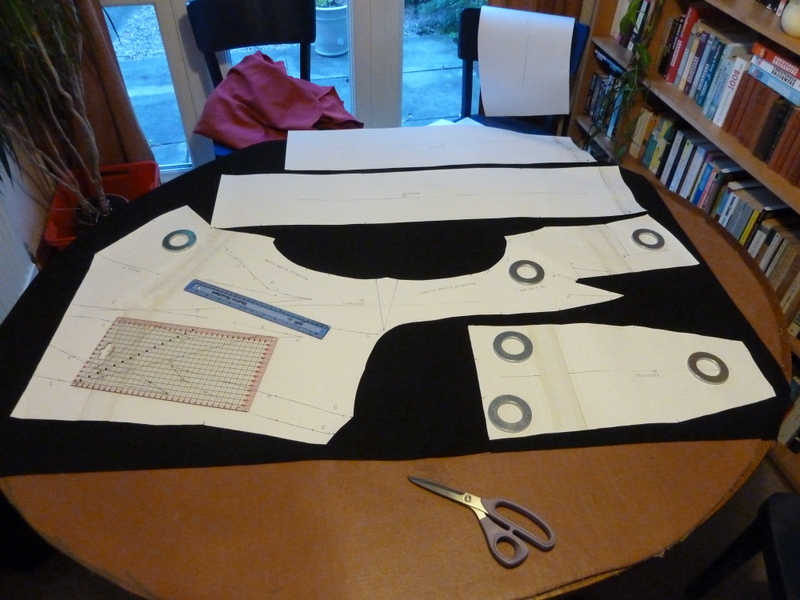 The photo of your pattern pieces is helpful as I need to lengthen the top too. Impressive! Looks great on you too. The pleats add such a lot of visual interest. Wow! SUCH a showstopper! I love this jacket on you — It’s so *you*!– and I’m so impressed that you managed to make sense of it even without instructions. I just looked and couldn’t find them either! But I just downloaded the pattern again and unzipped it, and the instructions are in one of the PDFs inside the zipfile. I guess they updated it at some point. FWIW I had problems somewhere in the range of steps 10 and 13. I remember I definitely ripped out step 11 completely. I hope you make this one, I’d love to see your take on it. So impressed that you made this. (I’ve had the pattern printed out forever and I’ve been scared to even try!) It looks great. You always do such beautiful work. Kudos on the patience reserve to figure this one out! I am so impressed at your skill and patience in making this. I am also very jealous because I would love to be tall and Swinton-esque and able to wear this kind of thing. You and the jacket look stunning. I am in total awe that you perservered and figured this out! I downloaded it when it came out originally, but I wasn’t sure that it’d actually fit me when I was done so I admired from afar. This looks absolutely amazing on you, and I love the look. What Anne said! Inspiring work. It looks terrific! I downloade this some long time ago, and its just sat around in the project pile. I love the pleating on the back, congratulations on tackling it. Omigod, CD, you have knocked this one out of the ballpark! I am drooling and it’s so you! I had downloaded this pattern out of my love for all things Asian and just blanched when I looked at it and saw no sizes, but now I’m re-inspired, if anything can get me back to the sewing table after my recent skirt debacle, not yet posted, not yet finished. This is why I love sharing sewing with others, they can remind you of why you loved it in the first place. Thank you, thank you, oh, Extra-terrestrial Celestial One! Good god what an amazing jacket. Please please do wear it as it looks amazing. I love the back, particularly though the front is very chic too. Posing shoes …. not just for posing I hope! Catherine, this is simply outstanding! I love it. This is so cool and so you, I absolutely love it. I know I have this downloaded somewhere and hopefully will get around to it one of these days.